The examples presented in this chapter [308; 320] are illustrations of the concepts presented in the previous chapters. 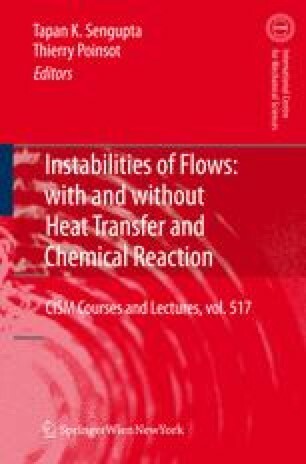 They correspond to recent numerical analysis of burners which are typical of most modern high-power combustion chambers, especially of gas turbines: the flame is stabilized by strongly swirled flows, the Reynolds numbers are large, the flow field sensitivity to boundary conditions is high, intense acoustic/combustion coupling can lead to self-sustained oscillations. Flames are stabilized by swirl. Swirl also creates specific flow patterns (a Central Toroidal Recirculation Zone called CTRZ) and instabilities (the Precessing Vortex Core called PVC).